The European Union does Germany a lot of good. To say that the country would develop better or worse without the common currency would be risky. However, the fact is that Germany is doing much better than other EU-members and the Eurozone has never been so dominated by one country. Germany has been growing faster at the regional as well as at the national level and has been gaining its relevance at others’ expense. Accusations of German supremacy may well be grounded, but then the question is who is to blame? Those who are able to improve or those who are lagging behind? German regions have been growing as fast as less-developed countries since the 2004 EU enlargement. 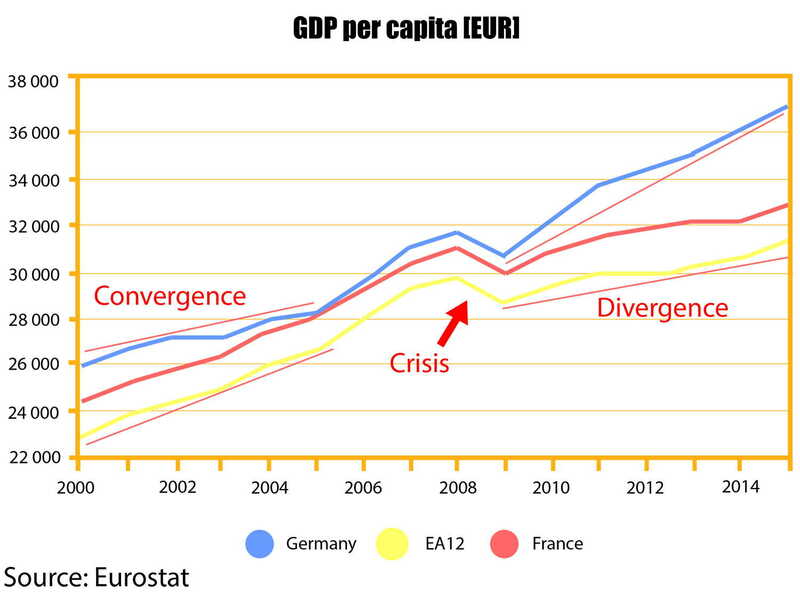 The euro has been often accused of having caused the problems faced by Southern Europe. The euro used to be undervalued for German economy and supported its exports, while for countries like Italy, Greece or Spain it was too strong, inducing their trade deficit and a large debt. There should also be no doubt that Germans have had a decisive word during the Greek crisis and that the fate of Greek citizens is at the hands of Wolfgang Schäuble and Angela Merkel rather than of Aleksis Tsipras. 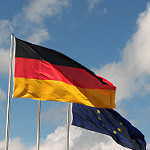 Conservative German economic and monetary policy is opposed also by France, the second largest EU-economy. And no wonder. 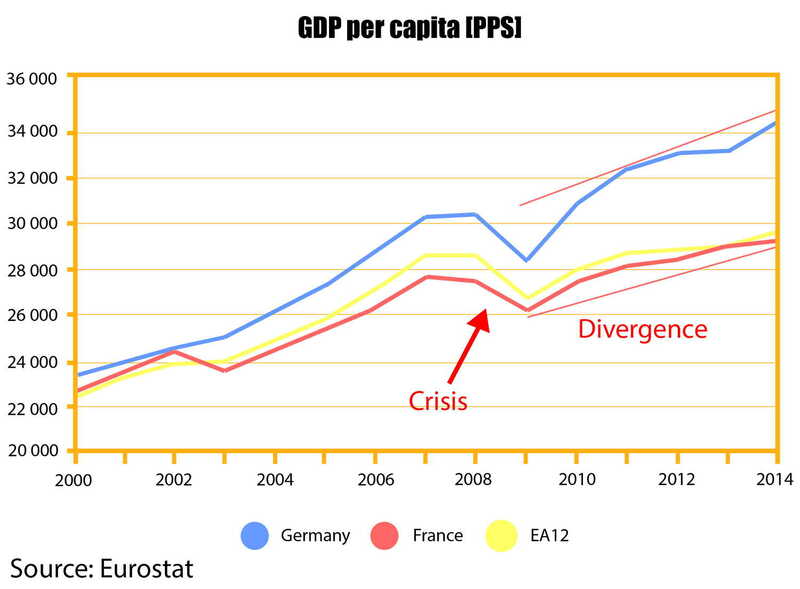 The level of the development of French provinces is now comparable to that of the regions in East rather than West Germany, while until 2009 French and German GDP’s per capita were almost equal in euros. Since the introduction of the euro, 34 of 38 German regions improved their relative position in the EU (they increased their GDP per capita as a % of the EU28 average), while in France only 6 from 27 regions have done so, according to our calculations. Convergence between countries and regions is inscribed into the European Union’s policy as a single market and it is fully natural that wealthy countries develop slower than poorer ones, so the disparities between rich and poor should be gradually overcome. Germany, the largest EU economy and the largest contributor to the EU budget should, in the light of the economic theory, lose its advantage over other states, which is not the case. GDP per capita as a % of the EU-average has decreased in most of the so-called old EU-members with the exception of Germany! The problem is even more visible in the recent post-crisis years. 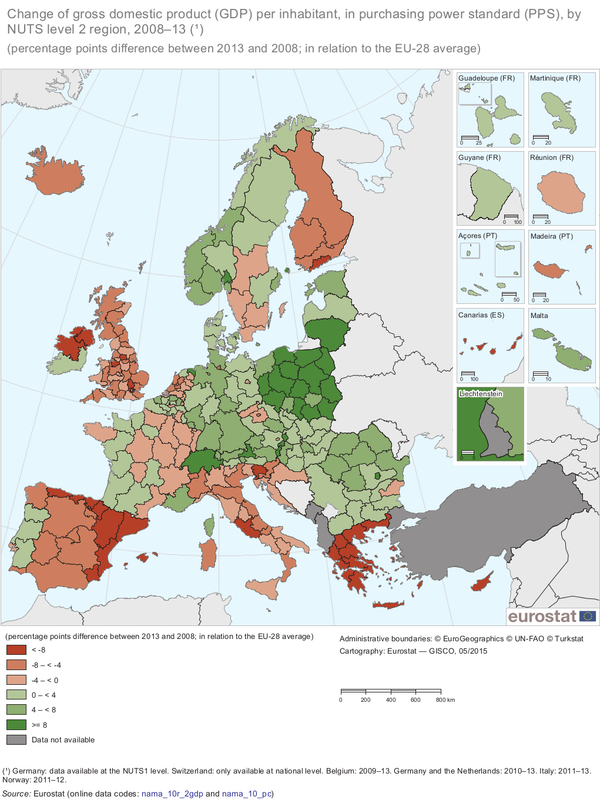 The map above shows which regions lost their contribution to the EU’s GDP. Theoretically, the most developed regions should grow slower so they should be colored in red, like the UK, France, the Netherlands or Italy. 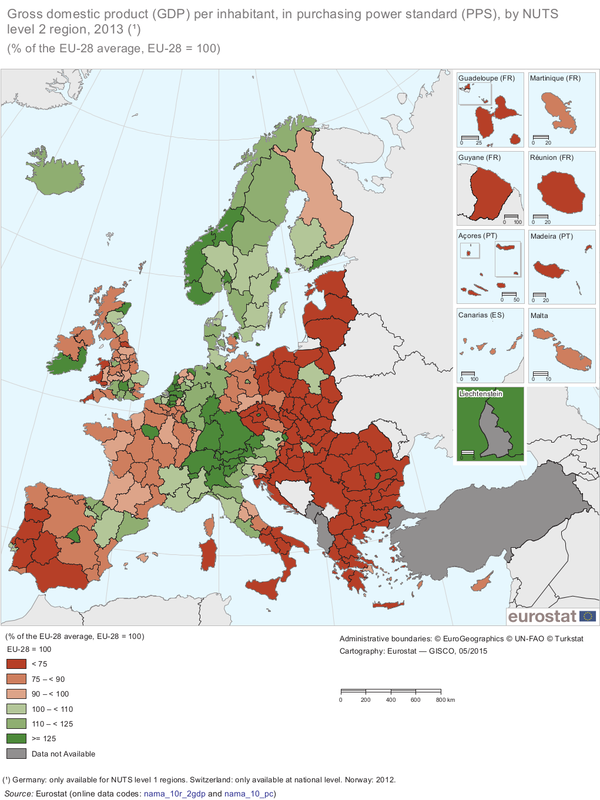 The poorest ones, mostly eastern regions of the 2004 enlargement, should have been developing faster and so be colored in green, like Poland, Lithuania or Romania, or even like Portugal (poorest old EU-member) or Greece. Putting aside Greece as a special case, it is remarkable to see that German regions have been growing as fast as those of the new EU-members, Austria and Denmark included. That said, disparities between Germany and the rest of Europe are increasing, which is completely against the idea of European economic convergence. The deepening disparity is even more visible if we consider the average citizen’s purchasing power rather than euros at current prices. It is clearly visible that differences between old EU countries, which mostly adopted euro, are growing in recent years instead of decreasing. This is not what we expected from the single market and from the monetary union. It is hard to believe that the EU could survive in terms of solidarity if a few German speaking countries dumped their southern “friends”. During last 5 decades of last century, the Deutsche-Mark was periodically re-evaluated as symmetrically for instance French Franc was periodically devaluated. – to become fully Federal, a single Nation : the United States of Europe dominated politically and economically by Germany. = the Euro = Deutsche-Mark. Who can realistically beleive nowadays, Europe will not burst ? if it was only to face the Immigration crisis. Who can beleive there is a majority in any of the 28 European Nations to accept to disappear, and be ruled by the Federal United States of Europe ‘s Laws …. dictated by Germany / German interest. giving Europe its independance as a whole. …. by France being out of NATO, having a permanent Seat at the ONU Security Conciil, its own and autonomous nuclear force od dissuasion, contesting the International Monetary System could be based (instead on Gold), on US Dollar, as UNIQUE International Currency) … . Why, 1ST, Euro has not been conceived to be the “common INTERNATIONAL Currency” for all Europeans and all those in the rest of the World which would have liked to enjoy an alternative at the worldwide hegemony of the USDollar and therefore of the USA ? Of course, you have a large historical army fighting each other in European history back to the Roman Empire. This is Europe the children of Mars and Barbarians infighting while the Empire rules from above. If most of the dynamics could be North European so of course the South should rule for safekeeping of all. Europe is Germanic related people in most part, a wheel from squared coveyances once dragged, the eye in the hurricane. Europe is Germanic related people in most part, a wheel from squared coveyances once dragged, the mainspring, the main gears among several, the eye in the hurricane. The Brexit should not be allowed for the wages of WW2 become cheapened dividends in pursuit of higher profits. Europe is Germanic related people in most part, a wheel from squared coveyances once dragged, the mainspring, the main gears among several, the eye in the hurricane. The Brexit should not be allowed for the wages of WW2 become cheapened dividends in pursuit of higher profits. The EU, UK, and US should be closer one united not many divided. Europe is Germanic related people in most part, a wheel from squared coveyances once dragged, the mainspring, the main gears among several, the eye in the hurricane. The Brexit should not be allowed for the wages of WW2 become cheapened dividends in pursuit of higher profits. The EU, UK Commonwealth, and US should be closer one united not many divided, and in essence are together the Samson of the UN., but apart as are the unknowing sightless. For every alleged atrocity against invaders or in colonies, is an applicable adage “a stitch in time saves nine”. For every alleged atrocity against invaders or in colonies, is an applicable adage “a stitch in time saves nine”. For all involerd in ordeals of the past, it is comeuppence of all to share in todays cognizances and the new peaceful horizon is no lesser than that of boundary wars formerly against each others interest. For every alleged atrocity against invaders or in colonies, is an applicable adage “a stitch in time saves nine”. For all involved in ordeals of the past, it is comeuppence of all to share in todays cognizances, and the new peaceful horizon is no lesser than that of boundary wars formerly speculated, which occured against each others populations interest.